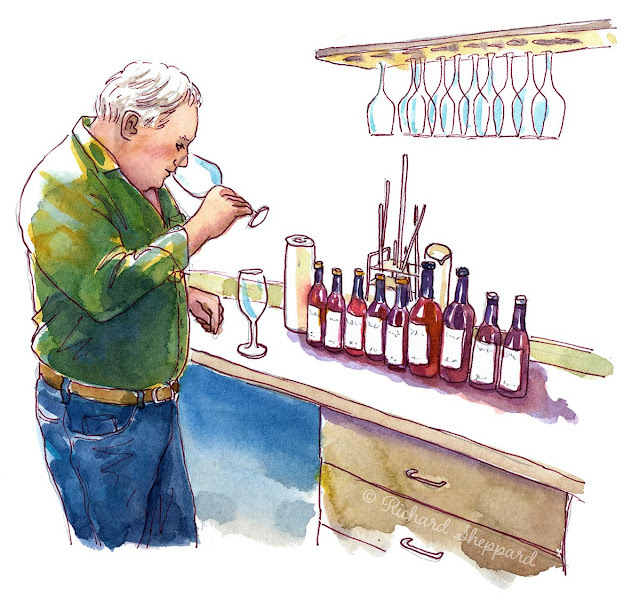 [By Richard Sheppard in Graton, California] Few vintners invite visitors into their wine labs, which reinforces the suspicion that winemaking is a mysterious process akin to alchemy. 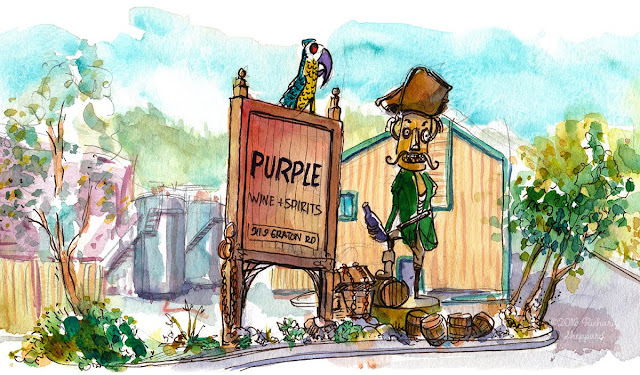 But with a little coaxing, master wine wizard Bob Goyette welcomed me into his Graton lab to see and sketch how he blends the wine after it leaves the crusher. Every winemaker’s methods are different, but the basic idea is the same: to guide the fermentation process, blending the resulting wine according to his or her style within the framework of traditional winemaking methods. Over lunch at Mexico Lindo, Goyette tells me how he got into the business in 1972. “I drove from Chicago to California on my new 350 Suzuki motorcycle with just a few changes of clothes,” he said. “At the time I was still in the Navy. But my first wine job was at Mark West. A few buddies and I used to sit around drinking French Burgundies after work as we dreamed of opening up our own winery until one day, it happened. 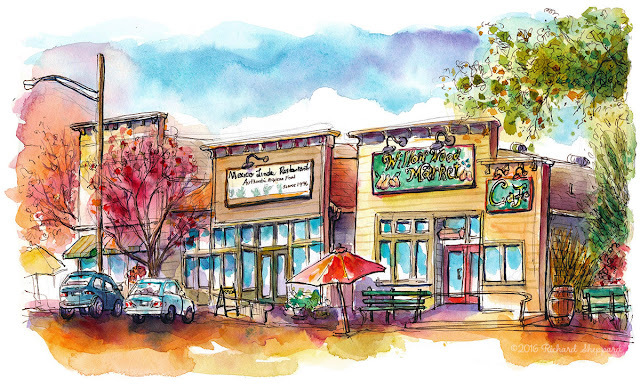 “In 1979, we founded La Crema Viñera winery, but today it’s just called La Crema. We sourced the best grapes we could find and copied French winemaking techniques, because that’s what people did back then. Despite the odds, we made some really good wines ... until we ran out of money,” he says laughing. Bob’s reputation as a fine winemaker helped him land at Benziger in Glen Ellen, where he stayed until launching his own Sebastopol-based brands, Stephen Vincent and Robert Goyette wineries. “I’d say the vineyard. To make great wine, you have to start with quality grapes, and they have to be harvested at the right time. If you wait too long the vines get tired, the sugar gets too high, and your wine gets too strong, losing nuance and complexity. Timing is everything. And of course, weather plays its role. After finishing our lunch, we walk across the street and behind a windowless building, entering through a side door where a large bottling operation is in full swing. The noise is monumental, and Goyette gestures to follow him down a short hallway. The lab is packed with computers, chemistry supplies and a variety of electronic equipment. “This is where we do our wine analysis,” he says, then leads me into an adjoining room. The room is sparse, with a lone calendar decorating the wall above a water cooler. Wine glasses hang upside down from a rack above a dozen small wine bottles at rest on the counter. “Today we’ll be working with pinot noir. Without getting too specific, these small bottles contain pinot from several different vineyards, some of which were aged in American oak, others in French. Still others were aged in neutral oak (barrels used more than four times that don’t contribute much, if any, flavor). We also have the varietal pinot meunier, which is similar to pinot noir. We’ll blend it in where we need it, for complexity. Goyette pulls two glasses off the rack, smelling each one for any off odors. Using a pipette, he measures wine out of a bottle and then pours the sample into a measuring cylinder. He repeats this process with several other wine samples, carefully noting the proportions. 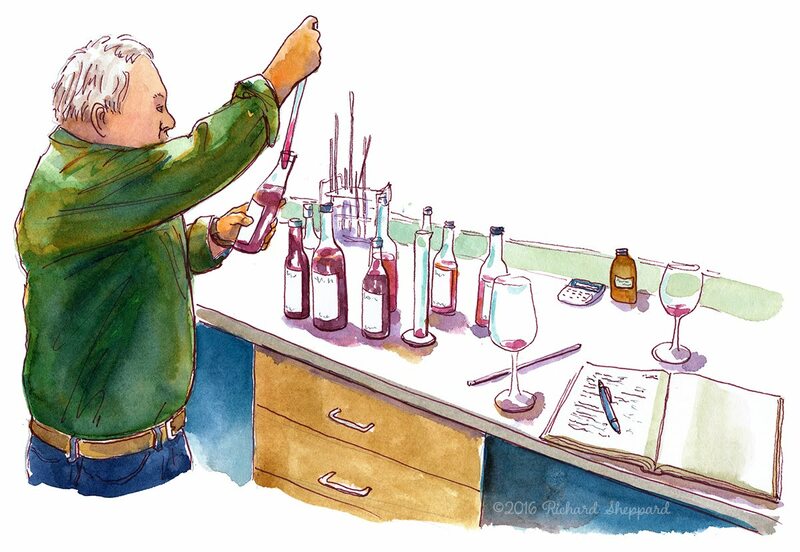 He then pours the combined sample into our glasses for tasting — the first blend. I swirl the wine in my glass and hold it up to my nose. It smells tight, unwilling to let go of its fruit. I also find it a little astringent in the finish. After a short discussion, Goyette stops to jot the ratios into his notebook. Then he creates a new blend. We rinse our glasses for another taste. Again, we discuss the wine, and this time we agree less oak is desired. After six rounds of tasting, the blend is finalized. It smells fresh with bright fruit, and is layered with earthy nuances and well-balanced oak. With my nose still in the glass, I’m reminded of walking on the beach with my wife in Pacific Grove, looking at tidal pools and sipping fine wine out of a plastic cup. At this stage, Bob’s crew will make the final blend in a tank according to the percentages in Goyette’s book. It will age in barrels until it is finished and ready to bottle, then stored until he feels it’s out of bottle shock, ready to drink. Bottling is similar to putting a frame on a painting. It’s out of the hands of the artist and is now displayed for the world to experience.